A quick gift for my daughter's girlfriend. A sweet little sun suit for a sweet boy born in July. This will be for next spring, it is a size 12 months. Featured on the bib front is a machine appliqued whale. Don't you love his a cute smile? 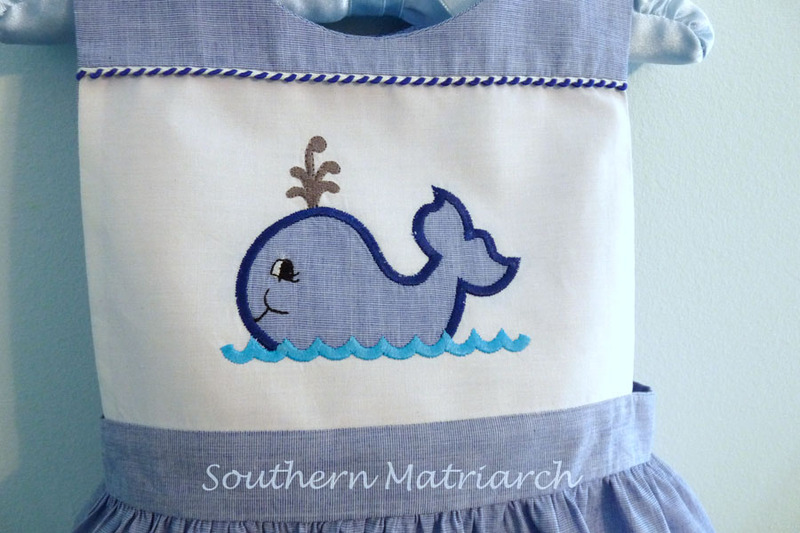 The machine embroidery design is a Sew Many Designs/Junebug Designs combo pack called Whale Ahoy. 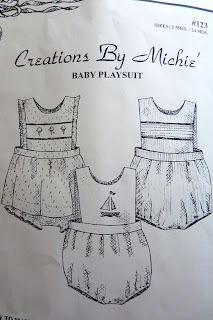 The pattern I used was Baby Playsuit by Creations By Michie'. It works up super fast. I think it took about as long to trace as it did to sew. It is made from a cotton shirting with pima cotton for the bib. I trimmed the bib with whip stitch piping. All from my stash. So a nice gift for the "cost" of 3 buttons. I don't consider it a cost if I shopped in the closet. I know I bought it sometime, just not this time. 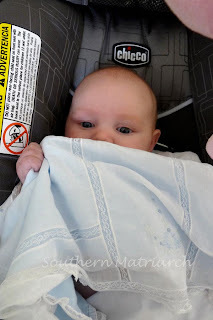 Someone has learned to grab onto their clothes, so her pretty gowns are up around her head all the time these days. She has even found a way to gnaw on them occasionally. I wonder what lace, starch and fabric taste like? Love how the machine embroidery looks on the sunsuit! Thanks for sharing. I love seeing your projects! 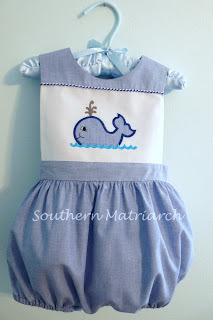 Such a sweet sunsuit for a little lad! 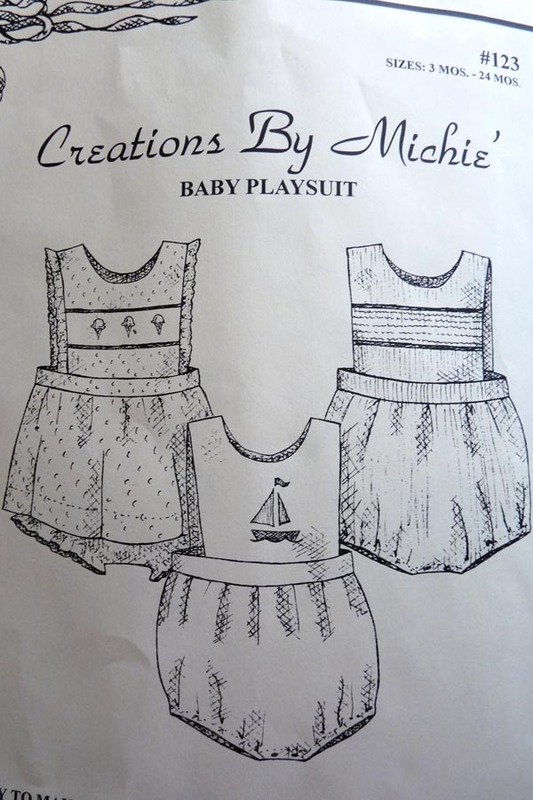 That baby is discovering what we already know: Mimi's fabric and lace confections are yummy! Martha, the sunsuit is so cute, and I love the photo of Evamarie exploring her beautiful gown! But, about those fingers . . . . The sunsuit is so cute, Martha. Evamarie takes my breath away, she is precious. Very sweet! I love the design on it. And of course the baby:) So glad you keep posting pictures of her. I think Evamarie is just trying to show off the lovely embroidery on the bottom of her dress.